Muktinath Helicopter Tour is the easiest way to visit Muktinath Temple located in the remote zone of Mustang District in Nepal. Due to its isolated geological location, Muktinath Yatra by jeep is very difficult. Even via a regular flight from Pokhara to the windy and small airport, Jomsom is too might be very challenging trip due to the worst weather condition. To escape from all this traveling trouble, Helicopter might become the only alternative option for your journey. Our three days Muktinath Darshan by Helicopter trip will ease you to visit the holy Vishu God temple, Muktinath Temple in just some hours from Kathmandu. The journey commences with an hour and a half flight from Kathmandu to Muktinath. People residing in Muktinath Valley restricted to land near the temple. So, our helipad will be at Ranipauwa. Ride on the horse for fifteen minutes will reach Muktinath Temple. Take a holy bath under 108 water springs and two holy Kunda. Change clothes and worship Vishnu God. After darshan back to helipad then, fly back to Kathmandu. 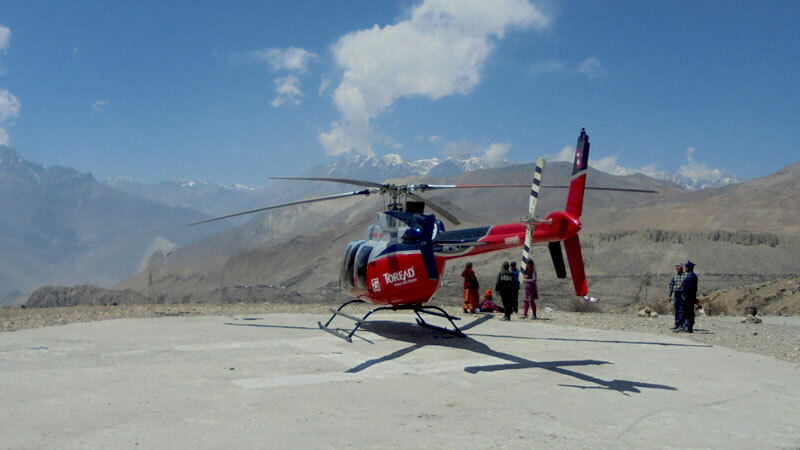 Please note: Kathmandu to Muktinath helicopter price depends upon the number of people traveling together. Because there are not any daily sharing basis helicopter tour package from Kathmandu or Pokhara or from Jomsom. One single five seated helicopter needs to get charter for you visit purpose only. Lesser people become expensive and more become cheaper. So, it is a good idea to travel in a group for Muktinath Yatra by Helicopter. Day 02: Muktinath Darshan by Helicopter. Early morning our guide will pick you up from your hotel. Then, transfer to the Kathmandu Domestic Airport where our helicopter will be waiting for us. Complete the formalities and fly from Kathmandu to Muktinath. The temple is about an hour and a half flying distance from Kathmandu. Arrival at Ranipauwa and wait for horses. Ride on horse up to the temple gate and walk for a couple of minutes. One and the half hour time is provided to visit the temple and back to the helipad. So, without wasting time take a holy bath under 108 water springs and continue to two holy Kunda. Change clothes and worship Muktinath God. Visit Jwalamai Temple then back to the helipad and fly back to Kathmandu. Arrival then transfers to your hotel and free time. Kathmandu to Muktinath by chartered helicopter. Wants some modification on Muktinath Helicopter Tour from Kathmandu itinerary? contact us to customize it.